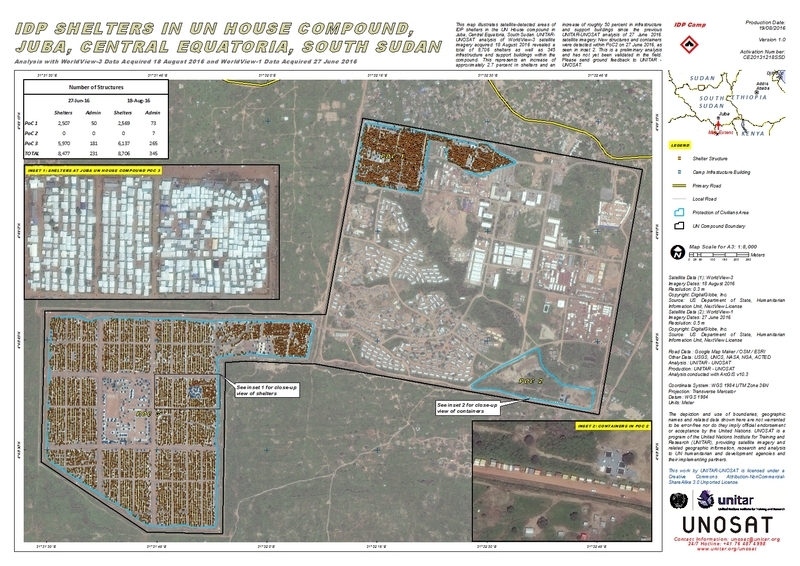 This map illustrates satellite-detected areas of IDP shelters in the UN House compound in Juba, Central Equatoria, South Sudan. UNITAR-UNOSAT analysis of satellite imagery acquired 05 September 2016 and 30 August 2016 revealed a total of 8,783 shelters as well as 320 infrastructure and support buildings within the compound. This represents an increase of approximately 4 percent in shelters and an increase of roughly 38 percent in infrastructure and support buildings since the previous UNITAR-UNOSAT analysis of 27 June 2016 satellite imagery. New structures and containers were detected within PoC2 on 27 June 2016, as seen in inset 2. This is a preliminary analysis and has not yet been validated in the field. Please send ground feedback to UNITAR - UNOSAT.